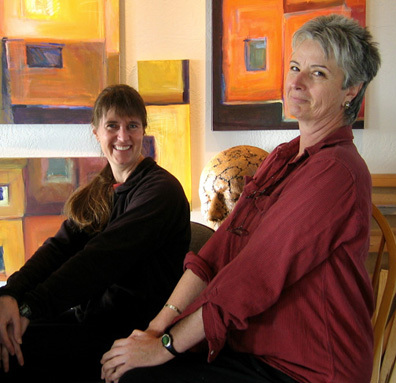 Donna and Carolee have been painting together weekly since 2000. One September day in 2007, they decided to swap paintings. Donna chose one of Carolee’s paintings and Carolee chose one of Donna’s to work on. That afternoon they worked into the early evening, so excited about the process of working on a painting that the other had started. They decided to create a new series of paintings which would be a collaborative effort. Each artist would start a painting, then they would switch and continue painting. At each stage, the artist would have complete freedom to change and work on the painting in any manner they wished. When the work is nearing completion, both artists would work more closely together until they agreed that it is finished and at a very high quality, allowing the Caradon signature. Each artist brings unique skills to the process, complementing each others’ work. The resulting paintings are incredibly strong, bold in color and design, plus they have that magic flair of added joy.